It’s that time of year again. The air is growing chilly, the leaves are changing colours, and there are pumpkin spiced foods as far as the eye can see. Yes, it is officially fall in Vancouver. And with fall comes one of our favourite family activities: heading down to the pumpkin patch to pick the best looking pumpkin you can find. Whether you are looking for one to cook with, for decoration, or to carve up for some halloween spirit, spending the day at a pumpkin patch not only gives you access to the best pumpkins around, but also serves as great day out with entertainment, food, and fun for all. Here are some of our favourite pumpkin patches from all over metro Vancouver with something for everyone. This family run farm hosts a pumpkin festival from mid September until the end of October that boasts barnyard petting zoos, tractor-pulled hay rides, and a sprawling pumpkin patch with fifteen varieties of pumpkins! And after you’ve had your fill of pumpkin hunting and animal petting, stop by the artisan food stands that offer farm fresh eggs, meat, vegetables and homemade preserves. The Aldor Acres Family Farm will be holding its pumpkin festival at 24990 84th Avenue in Langley from September 19th until October 31st daily from 9am until 5pm. General admission is $8 per person, and a family day pass for two children and parents is $38. Check out the Aldor Acres Farm website for more information. For another pumpkin picking adventure with tons to offer, head to Richmond Country Farms. An $8 admission ($12 on weekends) includes festive live music, a chance to meet Strawberry Shortcake, hay rides, a hefty pumpkin to take home, barnyard animals to see, and a farm-grown apple to snack on while you march through the patch. This pumpkin patch will be operating from October 3rd until the 31st from 9am to 1:30pm on weekdays, and from 10am to 4:30pm on Saturdays and Sundays, weather permitting. Drop by the farm at 12900 Steveston Highway in Richmond or visit the Richmond Country Farms Website for more information. 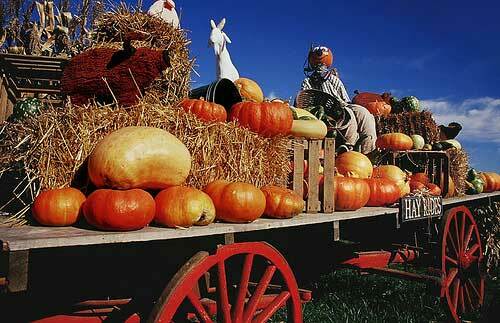 For pumpkin picking in the city, check out Southlands Farm in West Vancouver. Families can explore the farm on their own and interact with animals such as horses and lambs, before heading out to the apple orchard where harvested pumpkins are everywhere. 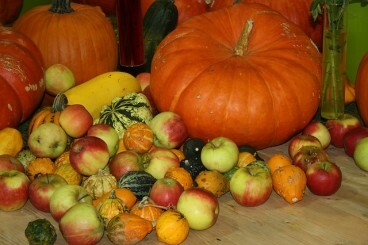 Southlands Farm says their pumpkins are both beautiful and delicious – great for jack-o-lanterns and pies alike. Admission to the farm for families is by donation, with pumpkins costing $5 each. Southlands Farm is open from 9am until 6pm on weekdays and from 10am until 5pm on weekends from the first of October until the 31st. Drop by the farm at 6767 Balaclava Street in Vancouver or visit their website for more information. The Port Kells Nurseries offer a lot of entertainment, including a hay bale maze, a haunted house for children, goats to feed, a chicken coop, tractor pulled hay rides, and of course the pumpkin patch. There is also face painting and a cafe with yummy snacks for purchase. Drop by the Port Kells Nurseries at 18730 88th Avenue in Surrey seven days a week from 9am to 6pm, or visit their website for more information. The Chilliwack Corn Maze is well known for its 12 acre corn maze, which is designed specifically each season, but did you know that it also boasts one of the best pumpkin patch events around? 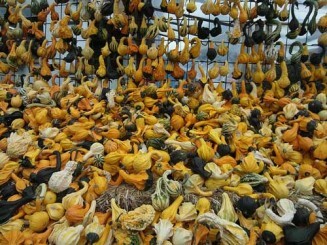 Perhaps not quite this many varieties..
With over fifteen varieties of pumpkins, you are bound to find the perfect one for you. 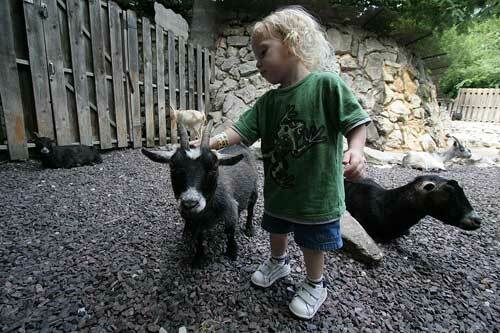 There is also a full day’s worth of entertainment for kids with a massive jumping pillow, pedal carts, duck races, an indoor hay bale maze, a tractor pulled “corn” train, farm animal petting zoos, a spider web climbing structure, a giant sandbox, swings, a tire mountain, tether ball, and even cow roping! To wind down, the family can hang out around the fire pit or even do the corn maze with flashlights for an extra challenge. Who would have thought there could be so much to do at a pumpkin patch? Check out the farm at 41905 Yale Road West in Chilliwack until October 31st from 6pm until 9pm on Thursdays, 11am until 9pmm on Fridays and Saturdays, and from 11am until 6pm on Sundays. 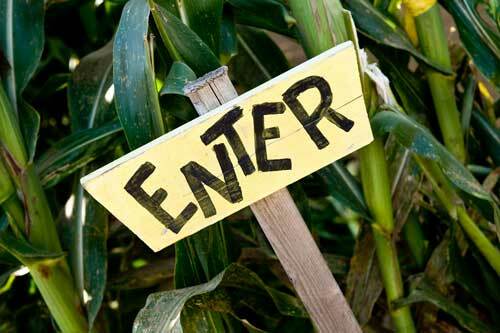 Or check out the Chilliwack Corn Maze website for more information.